The alarm goes off at 6am. After the previous day’s craziness and sleep deprivation, 6 hours of sleep feels downright luxurious. I decide against breakfast. Empty stomach feels great during a race, and as long as I get a gel in 15 minutes before the start, I will be good to go. Some things cannot be skipped, however… COFFEE! The drive goes by fast, and we follow a string of cars, who seem to be going to the same place we are, into a grassy parking lot. At least thirty minutes before the 9am elite wave start… We have time to look around, wave some hellos and simply chill. Mike runs into a fellow Death Racer – Leyla is part of the “You Just Got Chicked” gang. She is racing with us again in Ottawa next weekend. I’m actually starting to recognize faces at the start line. How cool is that? At the start line, Goss starts her warm-up as Mike and I muscle our way to the front. 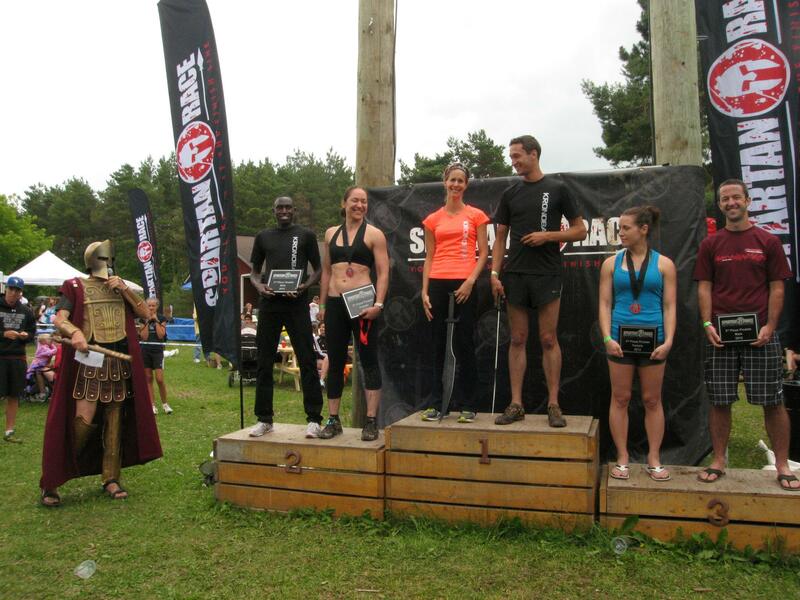 I say hello to Rose-Marie and Sebastien – the Kronobar team – these two came first in a number of previous Spartan races. If I manage to ever SPOT Rose-Marie on course, I will consider it to be my big racing success. 🙂 This girl is fast! Couple of gladiators at the front are pumping up the crowd. Rope ladder is the first obstacle, and I can’t find my footing. Mike is right behind me, then in front of me. 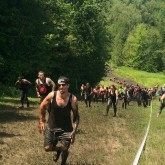 He flies over the rope ladder… Every Spartan race, we are racing each other shoulder to shoulder. Yet, he looks back, sees me fumbling with the rope, and before I realize what is happening, he is holding the rope ladder tight, so I can climb down. This is why I love racing… we all race each other, until one person seems to be in trouble, and then everyone turns around to help. It’s incredible. The rest of the race goes by pretty quickly. “You are 2nd woman overall”, one of the volunteers exclaims. I breathe out sharply. I know exactly who is ahead of me (hi, Rose-Marie), and at least today I do not stand a chance of catching her. Right now all I need to do is to keep going at the same steady pace, to keep my position. I settle in with another racer just ahead of me, and we edge each other on for the next fifteen minutes or so. As I pull out a chocolate gel, the trail ends in a clearing. 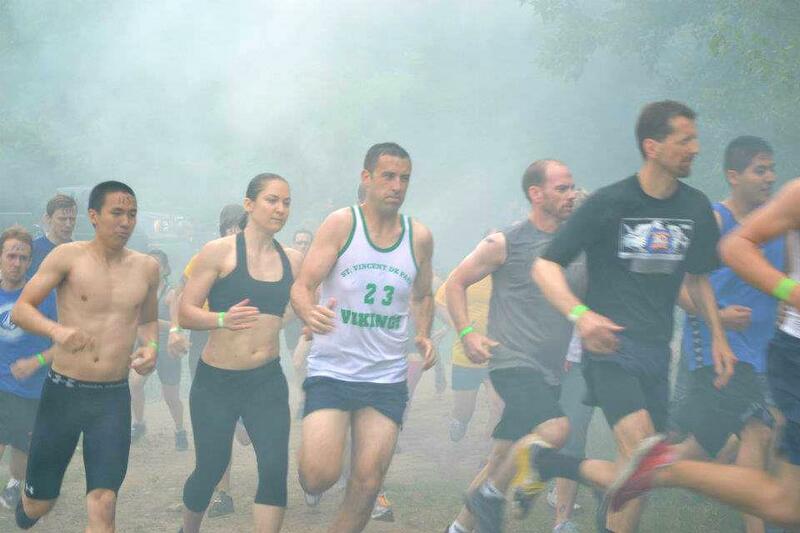 I toss the gel, jump over the fire, and run into the last stretch of obstacles, a crowd of spectators are cheering. Among the noise, I hear “Katya?!!!!”. I recognize the absolutely bewildered voice of my mother. It’s not exactly a surprise that she is here, since my dad is running this race too, however, it does throw me off a little bit. She has never seen me race. I jump on a rowing machine, bang out 15 reps (or was it 20? 30? all a blur). Barb wire is next. This time it’s stretched over a big box of ice. In theory, the obstacle is fantastic, however, the wire hangs way too low, at times lying on the ice cubes. There is a traffic jam, almost immediately. I wait for a couple of guys in front of me impatiently. “Come on, get in there!”, I exclaim. Many hesitate. If you have never done a similar obstacle, this one is difficult psychologically. Once the barb wire snags the skin, many freeze. 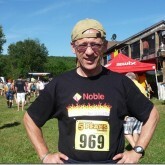 Those with loose t-shirts are at a disadvantage – there is a reason Mike always ends up shirtless at the finish line. I finally sneak into the corner of the ice box, and work my hands and arms into the ice to create a little bit of a tunnel. Barb wire snags. Unhook the best you can, keep moving. A tall wide-shouldered racer behind me gets a hold of my feet and starts pushing me forward. Excellent! That definitely helps. I snake around couple of guys who seem to be hopelessly stuck, and finally grab onto the edge of the icebox. That’s it! Pull myself to the edge and get out. My hands are bleeding, and my pants are down. 🙂 I have to keep running, as there are hay stacks in front of me. I attempt to pull up my yoga bottoms with one hand, but (as it turns out later) not before at least a couple of photos are snapped. Fantastic. Last few obstacles are always a blur. 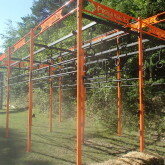 I muscle up the signature rope wall at the very end, and a red Sprint medal is placed around my neck. I loved this course! 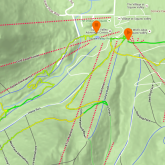 It was about 7km, so long-ish for a Sprint, but unlike the Mont Tremblant Super and Sprint, the obstacles were much more evenly placed. Rolling hills provided just enough of a challenge, but they were gentle enough that I was able to jog up all of them. Mike finishes minutes (seconds?) after me, and after a celebratory hug, we make our way to the finishers’ photo stand. Leyla joins us soon after. We catch with Goss, and compare battle wounds… That barb wire got her good. 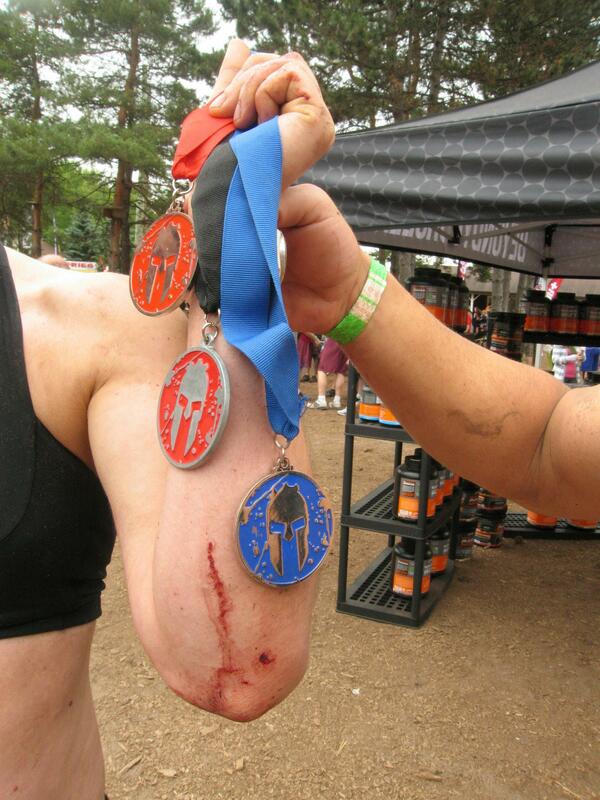 Medals are earned… Blood, sweat, and tears. Patrick, one of my teammates from 5 Peaks Trail Racing Series, came swooping in and took 3rd male overall!!!! Go, Patrick. 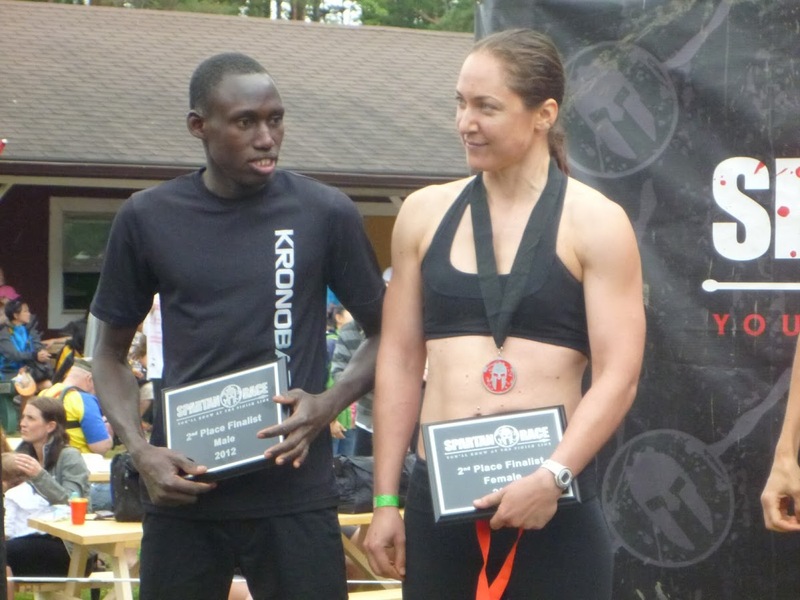 2nd male overall, and 2nd female overall. Can I just say that I’m tickled pink to be on the same podium step as this guy???? 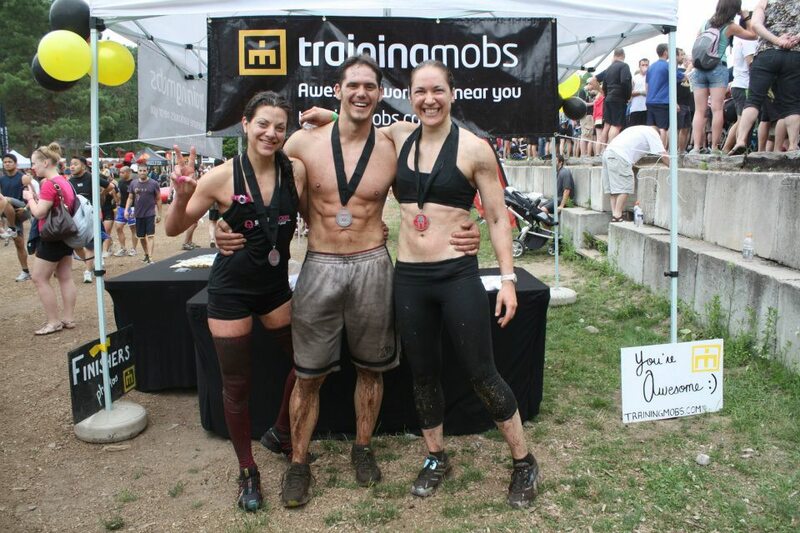 TEAM TRIFECTA! Ottawa Beast next weekend, and we officially earn that title! Catch me in the Get Out There magazine’s race recap video!